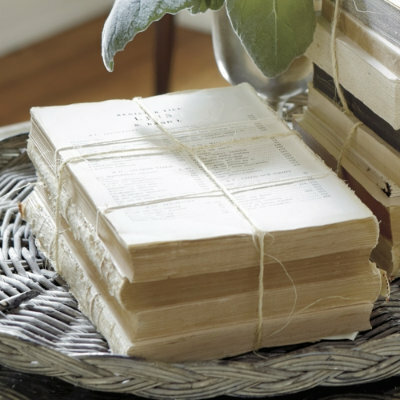 Make a stack of aged books in minutes using books from the thrift store! This easy book bundle craft is the perfect accent to any home decor. If you got the latest Ballard Designs Catalog, I’m sure you couldn’t help but notice their book bundles. Seriously, they was at least one every few pages! I’ve seen many bloggers knock-off this design, but in case you hadn’t seen them, I thought I’d show you mine. It’s so easy, it seems silly to write a post about it! I looked for books that would stack nicely together. Then, tear the covers off, and other pages until you get to the page you think looks good on top. While you’re doing that, steep some tea (I ended up using 4 bags). You can wait for them to dry, and then do a second coat, or leave it like this. Then, simply stack them on top of eachother, and tie them up (I used some jute I had in my craft supplies), and you have a lovely accent to your home decor! Sooo easy! Previous Post: « My girly stenciled desk! wow how cleaver! I love the way they look, so vintage! Yes your is much prettier then theirs…. I love yours better! Thanks for sharing…this is on my list now! I have a few sets around the house that I made and love them… You wanna know the funniest thing? PB and Ballards knocked of Miss Mustard Seed… She had them on her blog WAY before those catalogs EVER came out!! LOL! So now the big boys are knocking off the blogs.. Funny huh? I've been wanting to make these ever since I saw them in the bd catalog…great job! 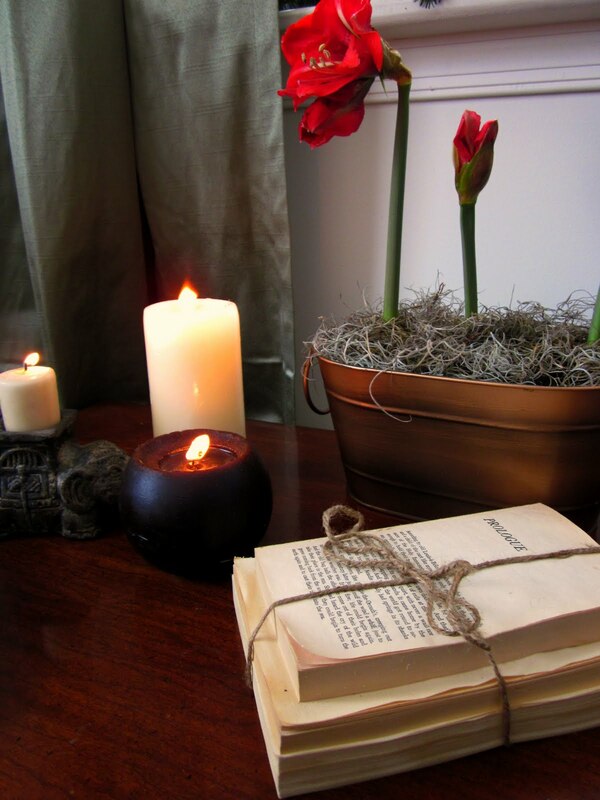 This is on my project list … so easy, so cheap and I just love the look! I love it! Thanks for the tutorial, I wouldn't have thought to use a tea bag – so it WAS very necessary! 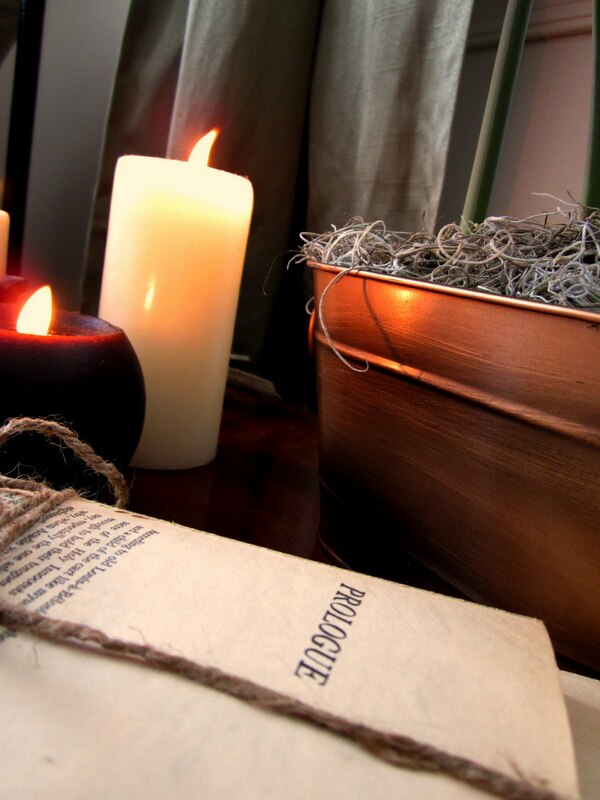 Your vignette is beautiful. Really? So easy and so pretty! Very cute!! Decorchick (I don't know if you are familiar with her site) actually did a post similar to this regarding the Ballard Book knock-offs, but I don't recall her using tea bags to stain the paper! Great idea! Love the way it added to the look! Very pretty! Never thought to take the covers off of old, ugly books. Nice transformation! Yep. Yours is MUCH better! As a lover of books this is very painful to me. Looking awesome! Those books look so vintage! Visiting from Dittle Dattle! Yes, I am seeing these in Pottery Barn, too. Our thrift store has a bin with books that have the covers off..I will buy a stack and do this cute trick. Love them! I hope you'll come link them up at the craft catwalk! oooo! I love!! We are supposed to be snowed in tomorrow and this would be a perfect, indoor, sitting by the fire craft. Thanks for sharing! What a cool idea! Oh my goodness, anytime, girl. 🙂 You rock. And hey! Congrats on being featured on Just Somethign I whipped up!!! That was so cool to see you on there!! Love these!! Found you through DIY Showoff. Will you share them this weekend at my linky party? Great idea. Time to look for some old books in the basement. I saw these at BD and couldn't BELIEVE how much they wanted for them. Good golly the things people will pay for. I love your version! I swear I commented on this already… guess not! Very smart and BD chic ;)) Good for you and excellent job! This looks great! I like yours better too!! Whenever I "antique" anything when I'm paper crafting I just use a brown ink pad and rub it along the edges of whatever I'm doing- a little bit less mess and it's always on hand! Cool idea! I love the tea stain idea! Thanks for the tea tip — worked great! 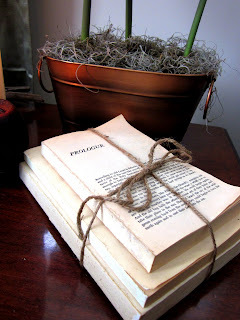 Although I’ve seen and loved book bundles all over blogland, I’ve never actually seen a tutorial until now. Thanks for sharing the details!